Structured illumination microscopy imaging showing subcellular probe labeling of functionally active enzymes called cathepsins, in the lysosome. The green fluorescence stems from probe-labeled enzymes, and the red fluorescence is from a fluorescent antibody specific for lysosome membranes. Probe-labeling fluorescence is surrounded by the antibody fluorescence, showing lysosomal localization. Results: A team of scientists from Pacific Northwest National Laboratory synthesized a chemical activity-based probe (ABP) that can provide new information about how living cells function. The new ABP is designed to enter a living cell without interacting with anything until it enters a specific organelle: the lysosome. This proof-of-concept ABP then labels only functionally active enzymes called cathepsins, which are cysteine proteases, in the lysosome. Using proteomics and super-resolution microscopy to view these labeled enzymes, the scientists now are able to see organellar activity. Their work, which demonstrates the ability to manipulate chemistry to better understand biology, has been published in Angewandte Chemie International Edition. Why It Matters: Found throughout mammalian cells, lysosomes are important for cell stability as the "housekeepers," disposing of unnecessary or nonworking components. They also play a role in many different diseases, among them cancer and Alzheimer's. Understanding the function of lysosomes is increasingly believed to be important for understanding such diseases, and the discovery of novel disease mechanisms regulated by enzyme activity can open new avenues for their treatment. However, studying protein functions in a single organelle is plagued by problems. If cell lysis, or breakdown, is performed in the analysis, isolating particular organelles is especially challenging and can result in severe protein degradation and complete loss of the native physiological context of enzymatic/organellar functions. To address these problems, the PNNL researchers used careful chemical design to create a probe that specifically targets only a particular subcellular compartment within a live cell in its native physiological context. "In our study, the probe tells us, in a given cell state, what enzyme activities are going on in the lysosomes," said Dr. Aaron Wright, a PNNL chemist and the corresponding author of the paper. "These are degradative proteins, meaning that they destroy cellular contaminants and other macromolecules marked for destruction. So, a better understanding of their function can help scientists find ways of controlling the degradation process or identifying missing components of these pathways in diseased individuals." Dr. Richard D. Smith, PNNL Director of Proteomics, and a coauthor of the paper, added: "Organelle-targeting ABPs in conjunction with proteomics hold great promise for characterizing enzyme activities in the wide range of diseases and other biological processes linked to specific subcellular locations." But biomedical applications are not the only target. "We believe this approach will be widely applicable for the analysis of biological systems, such as the microbial communities and other systems important for many DOE interests related to bioenergy production technologies" said Smith. 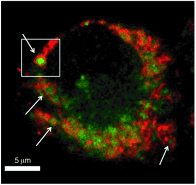 Methods: The PNNL team induced autophagy, the activity performed by lysosomes when doing their housekeeping duties, then monitored it using mass spectrometry-based proteomics and super-resolution structured illumination microscopy, or SIM, at EMSL, a U.S. Department of Energy national user facility at PNNL. This provided evidence that the labeled organelles are lysosomes. They also found that the enzyme activities increase, as expected. "The biology studied here was largely for proof-of-principle, meaning it was already fairly well understood in the context of lysosome catabolism," said Wright. "Our goal was to demonstrate that we can alter the physiochemical properties of a chemical probe for specific live-cell subcellular targeting of protein functions. This also gave us the opportunity to use EMSL capabilities. Now we plan on working with real lysosomal dysfunction systems." Wright currently leads chemical biology and activity-based protein profiling research at PNNL. He and lead author Dr. Susan Wiedner, a former PNNL Linus Pauling Postdoctoral Fellow, have been working on these efforts since 2010. What's Next? The ABP's targeting ability should be applicable to other organelles. In addition, switching the electrophilic warhead, or reaction group, of a defined organelle-targeting ABP would allow targeting of other resident enzyme families. Sponsors: The research was supported by PNNL's Laboratory Directed Research and Development Program, the National Institutes of Health's National Institute of General Medical Sciences, and the PNNL Linus Pauling Distinguished Postdoctoral Fellowship. This work used instrumentation and capabilities developed with support from NIH and the U.S. Department of Energy Office of Biological and Environmental Research. Research Team: Susan D. Wiedner, Aaron T. Wright, Lindsey N. Anderson, Natalie C. Sadler, William B. Chrisler, Vamsi K. Kodali, and Richard D. Smith, all PNNL. Reference: Wiedner SD, LN Anderson, NC Sadler, WB Chrisler, VK Kodali, RD Smith, and AT Wright. 2014. "Organelle-Specific Activity-Based Protein Profiling in Living Cells." Angewandte Chemie International Edition. 53(11):2919-2922. DOI: 10.1002/anie.201309135. Activity-based probes being developed by the PNNL scientists are cell permeable, meaning they can enter a live cell. Each probe has a reaction group that labels a specific enzyme (in this case, active cathepsins) and a binding group that guides the probe to a specific organelle (in this case, the lysosome). Each also contains a small alkynyl (two-carbon) unit that allows for the rapid attachment of just about any reporting group (e.g., fluorophore or enrichment moiety) via click chemistry, thereby permitting multimodal measurements. The reaction group targets a particular protein function, so to target a different enzyme class, the scientists can change the reaction group, but keep the binding group. The binding group is like the address on an envelope. It gives the probe directions to the appropriate cellular location.